Last year went a bit wonky for me. What with surgery in the Spring, followed by not getting quite as well as I had hoped for. Then I had all the fun of learning I was to be assessed to see if I was "fit for work" under the Employment Support Allowance (ESA) which is replacing the Incapacity Benefit I had been on, for about 10 years. This caused me so much stress and worry I am still amazed I got through the year with my brain intact. While I had all the uncertainty going on, I found myself go through a bargain yarn buying frenzy. I was so scared that I was going to lose my benefits and not be able to afford yarn that I just bought up ALL THE YARN! Now I have learnt that I have been moved successfully over to ESA from Incapacity Benefit, which means I will continue to receive my benefits for the next 12 months. This stay of execution has made me re-evaluate the yarn that I own, and the books and the magazines. It has all got a little out of hand. I was already considering cutting back on the yarn buying when I was mocked excessively by my dearest friends and my partner on Friday. I was called on how much yarn I owned and was challenged that "you can't possibly know how much you have, surely?" . Of course I was stupid enough to say - "Of course I do, it's all on Ravelry!" So of course the next question was "oh, so much do you have?" 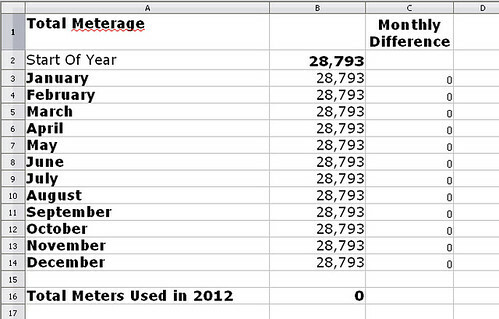 I was then forced to mutter, after quickly checking my stash database that I have 253 entries. As you can imagine there was much jeering and taunting from the gallery, and not even my very sound reasoning that it could be called insulation, would calm the baying throng. Admittedly, this jibing was all in good natured fun, and there was no malice or even real criticism involved, but it did make me pause a little bit after looking at my entries. So whilst I am avoiding making this a resolution post - because I don't do resolutions, I have decided it's time to get my act together and work out what the hell I'm doing with this enormous quantity of yarn and patterns. One of the other questions in "let's torment Chrissy evening" was "so how many miles of yarn is that then". I refused to even contemplate answering that question. This question was actually answered when I was taking that nice little screen dump I have higher in this post, when I noticed the button which says "Export to Excel". I thought I'd click it and see what happened. I was amazed, because it imported my stash into my OpenOffice Calc program and showed my stash in all it's gory details. I have 28,793m of yarn in my stash. Gulp. That's a LOT. Not very glamorous is it? Never mind it will serve it's purpose. I'm going to set a reminder on my calendar to perform this export on the first of each month and I'm probably not going to give you an update every time, but at least I will know what is going on with my stash. Of course now I am keeping up to date with my stash, I need to start using my magazines and books. I am currently working my way through a massive pile of magazines and I am ripping out all the patterns I might conceivably want to knit one day. I am also keeping all the tutorials. I am putting them in plastic sleeves and filing them in folders by category. I'm then going to work through the folders and work out if any of my yarn and patterns could work together and then I'm going to queue the projects so I can see what the yarn is destined for when I look at my stash. Obviously I'm going to do a similar matching up program with my books. 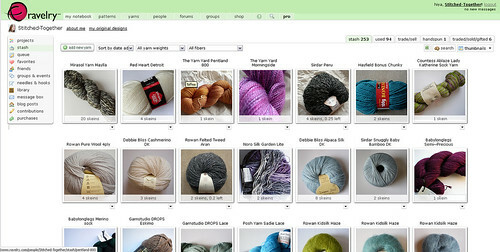 Hopefully when I can see what patterns are going to be used with what yarn it will stop me buying yarn to knit a new and shiny project that I've just come across - which is what usually happens. I'm also hoping, that by matching yarn and pattern, I will have less "faffing about" on Ravelry. I will be able to go to my queue and pick out a project according to what I fancy making, without losing days in a surfing frenzy. I will have a finite number of choices, which will hopefully make choosing that much quicker and less painful. I guess this is technically what you could call a Work in Progress, because that is what it feels like. I want to spend this year getting back in control of all sorts of things. The yarn and knitting thing is just the first step on the journey, and probably the only one I'll blog about, because that is the only thing even remotely interesting and to be honest looking at this post, I'm thinking I shouldn't really be sharing this nonsense with the world. However, in order to keep me on the straight and narrow I've got to share my intentions, to keep me moving in the right direction. 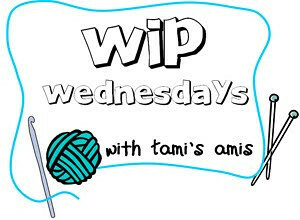 So in that spirit I've hooked up to WIP Wednesday. Click on the button below to take you to actual crafting works in progress!